Stunning Private Family Property W/Resort Amenities - New! Aerial View of property. Main house, pool, and carriage. Location. Location. Location. East Orleans. Nauset Inlet and outer beach beyond. Mere steps from the home. Livingroom with skylights. French doors to patio w/firepit. Dining Area - hutch (not seen here) with serviceware, stemware. Fully equipped kitchen. Good memories made over great food. Queen bedroom w/seagrass headboard and hand painted bureau. 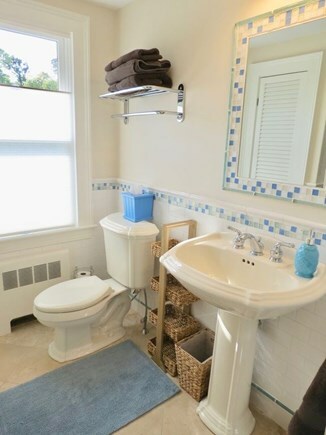 First floor bath with stall shower (not shown). Master bedroom in main house. 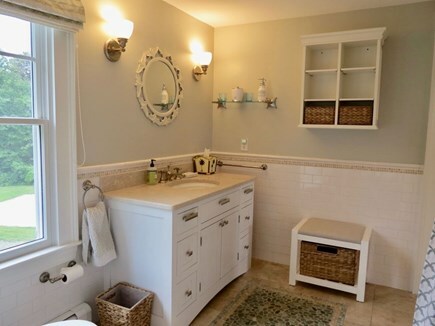 Master bath w/tub shower and plenty of storage. 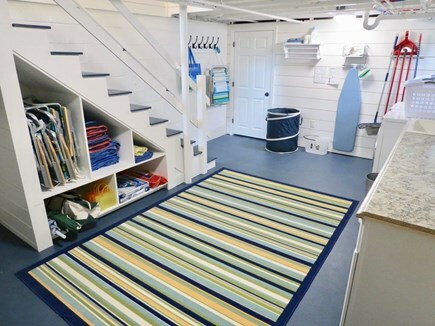 Laundry room and beach equipment storage. Pottery Barn table on deck. Pool and carriage house beyond. 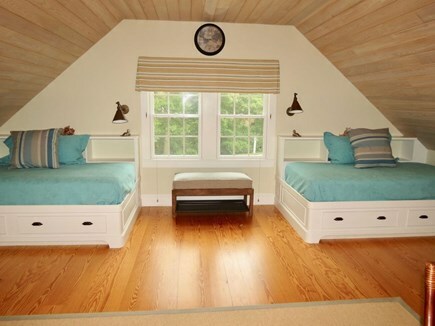 Custom twin beds with storage. 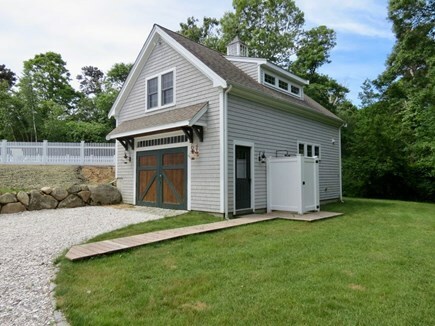 Carriage House, boardwalk and outdoor shower. Carriage house w/double doors open to pool. Side door not shown. 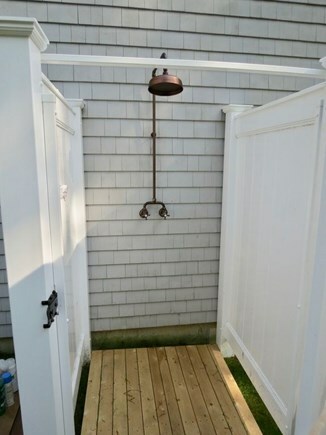 Outdoor shower at carriage house. One of two. Kayak on beach cart makes transport a breeze. Fire pit, hammock and pool. Pool area with seating for lounging and dining. Home in the evening. You're gonna love it here. Last Week of Summer Splash Sale! Aug 25 thru Labor Day (8 nights) for $8,000.00. Unbeatable. This home was designed for an exceptional family vacation. This is our first full season on the Cape rental market, so we offer you a chance to book early and claim your week(s). Recently updated with every amenity for an unsurpassed vacation experience. Location. Privacy. Heated Saltwater Pool. Fire Pit. Carriage house with recreation room. Deck. Two outdoor showers. Hammock. Walk to salt water Inlet. Kayak to remote ocean beach. Pottery Barn decor. Lovely grounds. Ping Pong. Croquet. Bird feeders. Quiet street. Lovely plantings. Well equipped. This house has everything you need for a happy, fun-filled vacation. Let's dig into the details. 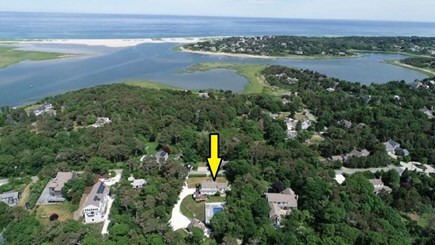 This sprawling estate-like property with main house, guest house, new heated salt water pool and picturesque Nauset Inlet at the end of the lane is both charming and luxurious. This unique home is lovely inside and out with manicured grounds & Pottery Barn decor. 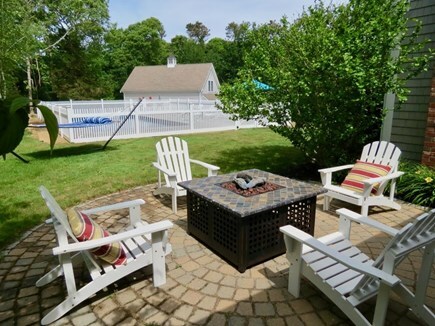 Enjoy the heated, saltwater pool, fire pit, kayaks and a custom made cart for easy transport to the water. 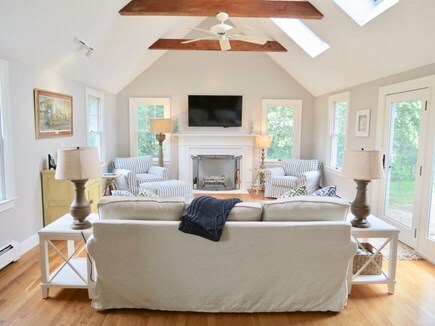 The location is ideal—minutes to East Orleans Village, downtown Orleans, and fifteen minutes to Chatham making it an ideal spot to begin your vacation. 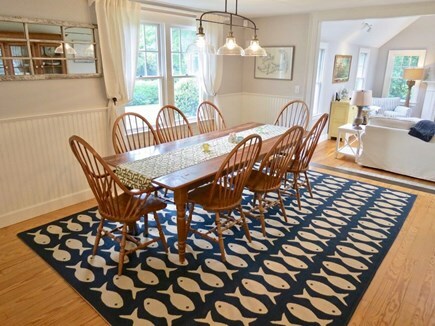 Quaint shops, fantastic bistros, independently owned coffee shops, homemade ice cream, miles of bike trails, Cape Cod baseball, bountiful farm stands, big surf beaches, tranquil bay beaches and freshwater ponds are all nearby. The main house has been recently updated, and features central air conditioning, four thoughtfully designed bedrooms, and two bathrooms. 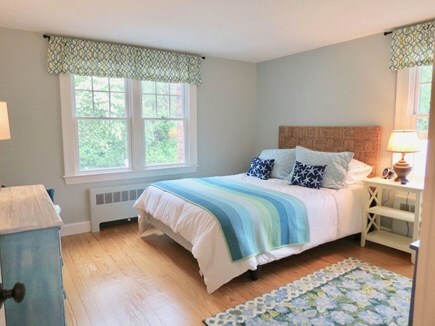 Two bedrooms are located downstairs, one with a queen size bed and the other with two twin beds. Upstairs there is a massive master bedroom with a king bed (Leesa mattress) and sitting area overlooking the grounds. A second twin bedroom is located on the second floor along with a master bathroom with tons of storage, deep tub and beautiful tile work. The open concept living area boasts a well equipped kitchen with new gas range, breakfast bar, dining area and a sky-lit family room with a vaulted beam ceiling. The decor is comfortable and stylish, and the home is equipped with everything you'd want on vacation from stemware and wine buckets to outdoor dinnerware, games, books and a kitchen worthy of your best cook. 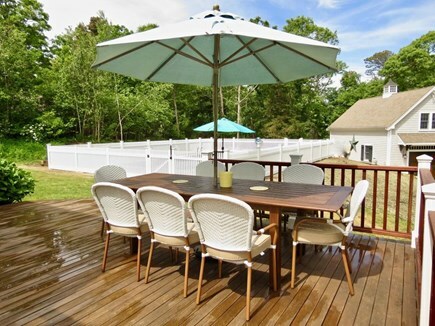 The huge mahogany deck with a new gas grill and Pottery Barn dining set under a market umbrella is located just off the kitchen. Hedges trim the front of the home and provide privacy even when playing croquet in the front yard. A long seashell driveway leads to the carriage house, and exterior lights line the property when the moon isn't providing the ambiance. Behind the home is conservation land, so get ready for some fantastic bird watching. You'll feel like you're far from the crowds yet you are only minutes away from all the action! 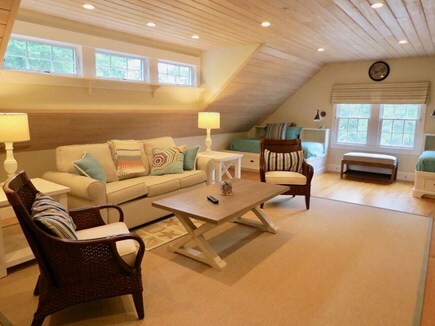 The kids will love the carriage house! The lower level game room opens with two massive doors to the outdoors for those nice afternoons when running back and forth from the pool. 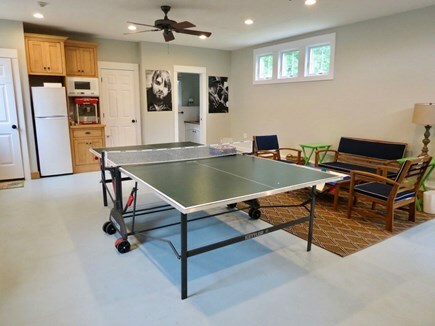 This room features ping pong, games, a popcorn machine, ceiling fans, flat screen TV, bathing suit seating, kitchenette, half bath and outside you'll find a new boardwalk leading to a fabulous, new outdoor shower. Upstairs, is a superbly finished and conditioned space with wood ceilings, built-in entertainment center, and two sleeping areas—one with twin beds and one with a Pottery Barn sofa that opens to a super comfy queen bed with a real mattress. All linens are cotton with top quality quilts and pillows. 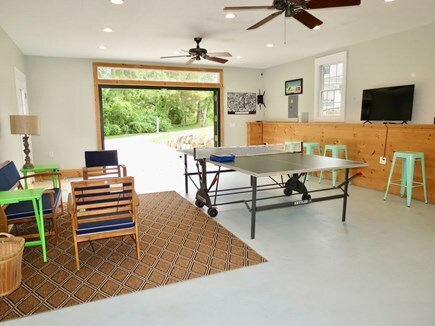 The carriage house is the perfect space to accommodate a second family, visiting friends, grandparents, teenagers or simply serve as the family hangout. Active families will love the kayaks, stand-up paddle boards, surf boards and other beach toys. Pack up the custom beach cart and head to the seashore experience at the end of the road! When home beckons, enjoy the tranquil privacy of the gardens that frame the yard and serve to elevate the outdoor living experience—with the new saltwater pool as the centerpiece. 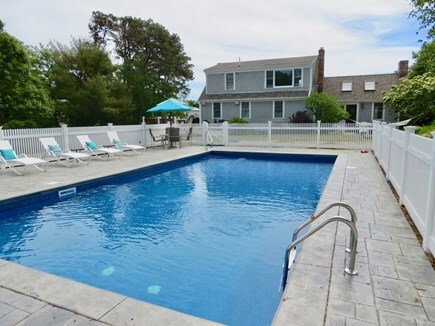 The heated, saltwater pool and deck looks like a resort with table seating and Front Gate lounge chairs. Bring the bluetooth speakers poolside and swim laps or enjoy some private time with classical music, a book and the bounty of nature. Lawn games add to the resort feel. Challenge the kids to croquet or tether ball. Perhaps the hammock has your name on it? Oh yeah. At the end of the day, fire up the gas grill for a family BBQ and feast on the night sky. After dinner, enjoy a glass of wine around the fire pit and under the stars. Or log into your Netflix account on the 65 inch smart tv for a classic movie. When you finally crawl into our crisp white sheets you'll sleep like a baby. Awake to a sunny kitchen with coffee brewing on the Keurig and windows boxes in bloom. If you are a walker, you will love this location. 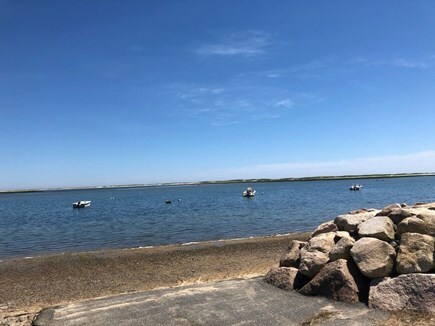 Stroll down our quiet street to Nauset Inlet where you can walk for miles along the water and gaze out to the outer beach. It's a little piece of paradise. 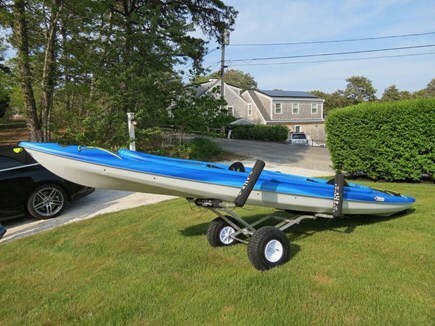 Those who live on this street often launch their boats or kayaks from the Inlet to the end of Nauset Beach to enjoy this remote area with cove swimming on one side and open ocean on the other: a treat rarely accessible to visitors. Stake your claim to a prime summer vacation at this extraordinary property! - You will be greeted by property manager at check in. - $50 Accidental Damage Protection fee added for nonrefundable insurance for accidental damage. - Full payment for bookings made after April 1. - No refunds after 7 days. - Property to be cleaned and beds made for your arrival. You are responsible for cleaning during your stay and, upon departure, to leave the home in generally the same condition you found it. - A “Check-Out'' list will guide your departure preparations and ensure protection from assessments for extra cleaning needed after you leave. - Occupancy limited to 12 people. Additional availability info: No cats allowed. Dogs allowed with restrictions. Additional pet deposits may be applicable. This is a Sunday to Sunday vacation rental. Additional pricing info: Cleaning and linens included. Stay later with an 11:00am check out. State and local taxes of 12.45% will apply. There are two bedrooms and one bathroom on the first floor that can be accessed from a sloping front yard and two steps to the front door. The main floor is one one level with a step down to the LR. This October my family and I spent a perfect five days at this property. No expense was spared in the thoughtful, beautiful, efficient, and cozy design of this getaway. 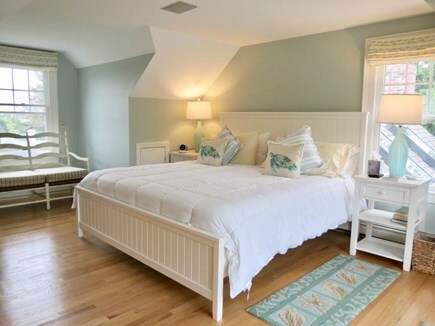 From the open floor plan to the sea-glass color scheme to the swimming pool to the fire table to the helpfully equipped kitchen, laundry room, and carriage house, every choice ensures that this house is the setting for a happy vacation. We can't wait to go back! Wow! This home has it all! Greg and I live in Winchester, MA with our two sons. 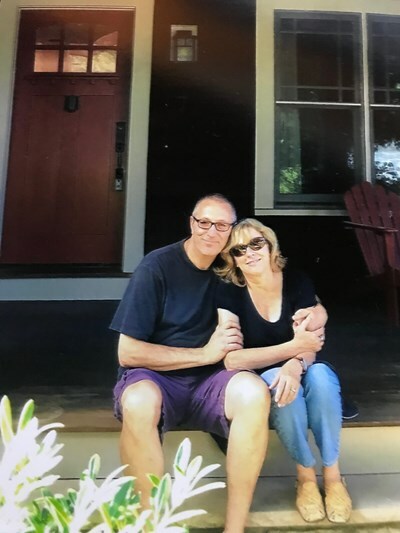 With years of experience in project management, real estate investment and home renovation, we formed New England Nest LLC. Under NEN, we have acquired property in fantastic locations renovating, restoring and then renting, managing the homes for the rental market. We own multi family homes in Winchester and Beverly Farms that are now spectacular apartments. When traveling with our boys we have always loved staying in private homes over hotels. You just can't beat the comfort and enhanced family dynamic in a home where you can share family meals, watch movies, play games and just unplug with those you love. 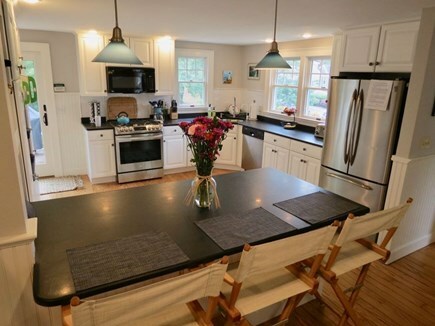 Over the years we have noted what makes a fantastic vacation rental. 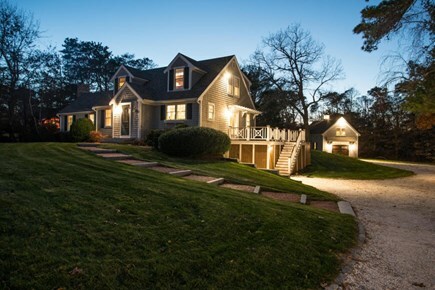 With that in mind, we invested on Cape Cod by purchasing this Orleans home in 2018. We fell in love with this property's location and setting - it needed updates but the location captivated us. And now with the updates it's fabulous. Greg and I are so excited to share this property with vacationing families! We strive to provide the special touches that make our vacation rental feel like YOUR second home ...from the moment you arrive. When our guests say ''you thought of everything'' it makes me happy! Location and Resort-like amenities. Comfortable and stylish.